The heart is a vital organ. It propels the blood and makes it circulate throughout all of the body’s blood vessels. Located in the left central part of the rib cage, between the lungs, the heart contracts an average of 70 times per minute, each day pumping 7000 liters of blood through the vascular system. The organ is essentially made up of one muscle, the myocardium, which contains four cavities : two auricles and two ventricles. The auricles receive the blood while the larger ventricles expel it. The ventricles are closed by cardiac valves, thin elastic structures that open to allow the passage of blood, then close to avoid its backflow. 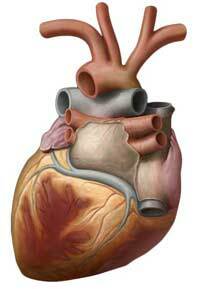 The heart is cone-shaped, and lined with furrows, along which coronary blood vessels supply it with oxygen. A person’s heart is about the same size as his or her fist. The heart of an adult human measures 4-5 in. (10-12 cm) across, 3-3.5 in. (8-9 cm) high, and 2.5 in. (6 cm) thick. It weighs about 10 oz. (300 g), about the same as a large grapefruit. The heart sits in the middle of the rib cage, surrounded by the lungs. It is positioned at an angle, with the upper part tilted slightly to the right in such a way that about two-thirds of the heart’s volume is on the left side of the body. What makes the heart produce sounds? The sounds that doctors pick up with their stethoscopes when they listen to your heart are the noises made by the opening and closing of the heart’s valves. The loudest and deepest “booms” are made by the closing of the atrioventricular valves. They are followed by the shorter “booms” that come from the closing of the semilunar valves. 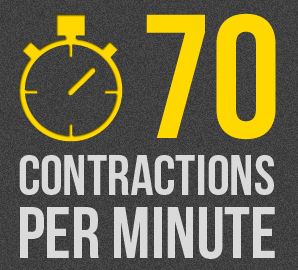 Any unusual noises may be a sign of a valve defect and must be taken seriously. 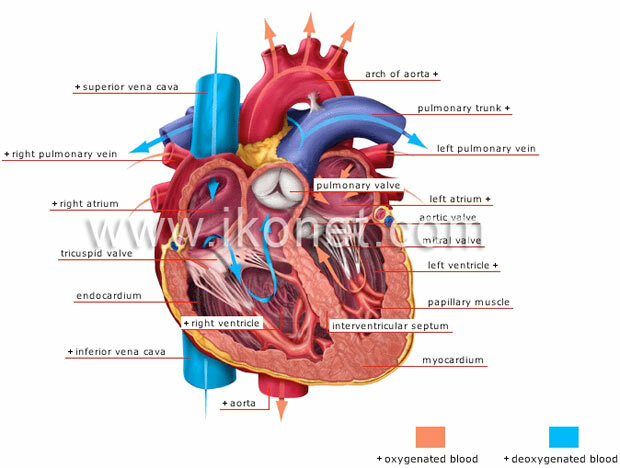 The heart and the blood vessels constitute the cardiovascular system. 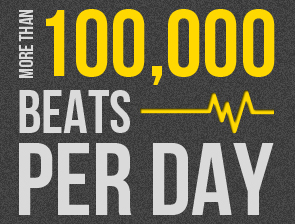 Pumped by the heart, the blood circulates throughout the body through a vast network of blood vessels. 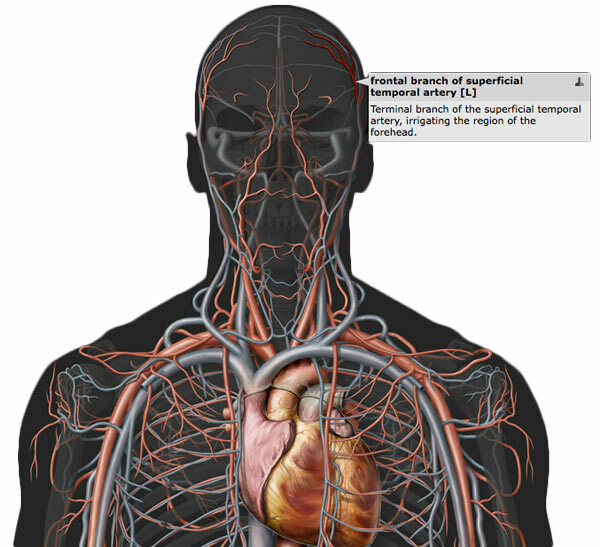 Three types of vessels transport blood: arteries, capillaries and veins. The rhythmic contractions of the heart pump the red fluid into the arteries. 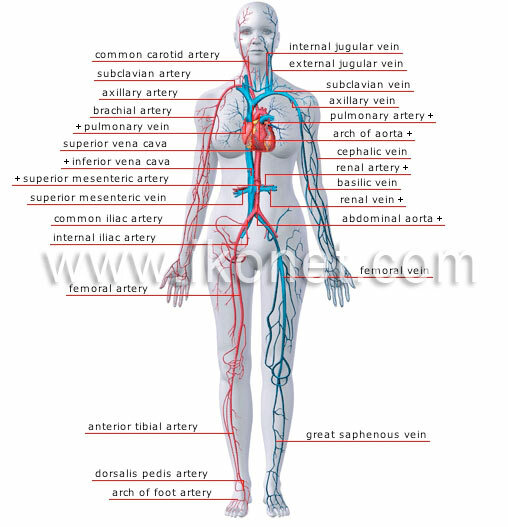 They arteries carry the blood from the heart to all of the areas of the body. The blood capillaries, which are minuscule vessels, then permit exchanges between the blood and the cells through their extremely thin walls. The blood is then rerouted towards the heart by the veins. The blood vessels form a network whose total length reaches 93,206 miles (150,000 km)! They are separated in two distinct circuits: pulmonary circulation and systemic circulation. Pulmonary circulation is responsible for the gaseous exchanges between the blood and the air contained in the lungs. 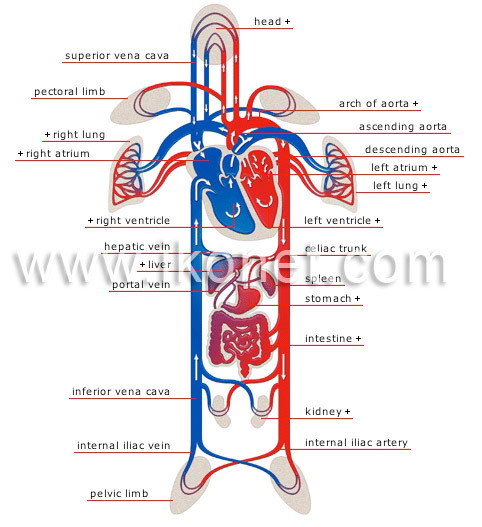 Systemic circulation is responsible for the blood irrigation of all organs and tissues. When the heart contracts, its two ventricles simultaneously eject blood into both circuits. Pumped by the heart, this red and slightly viscous liquid that circulates in the blood vessels is indispensable. Blood is responsible for transporting oxygen and nutritive substances to the cells and removing waste from them. The circulation of blood in the blood system participates in controlling body temperature and in regulating the volume of certain fluids in the tissues. In addition, the blood transports white blood cells, which defend our body against germs. Blood consists of a liquid element, the plasma, in which the blood cells bathe. There are red blood cells, white blood cells, and platelets. On average, plasma represents 54% of the total blood volume, the red blood cells 45%, the white blood cells and the platelets 1%. The red blood cells (or erythrocytes) transport oxygen from the lungs to the cells, and carbon dioxide from the cells to the lungs. The white blood cells (or leukocytes) have the ability to cross through the blood vessel walls and to penetrate the tissues in order to defend against pathogenic agents. There are three major categories of white blood cells: lymphocytes, monocytes, and granulocytes.